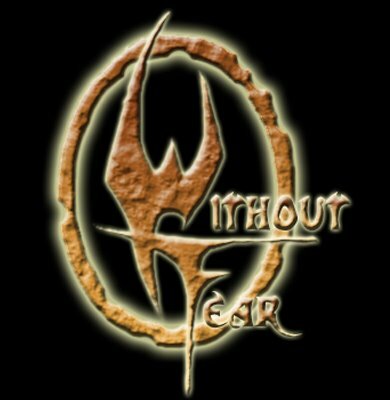 Without Fear is a Brazilian Heavy Metal band from Sorocaba, São Paulo. The Without Fear began when Vitor Machado and Luiz Melicchio, started to get together and form a band. The tough appear at beginning of 2002. At end of the same year, the band receive a complement, Cleuson enter to play guitar, brought with him Felipe, to the drums. This formation stay only a little audiences. So, in the beginning of 2003, Felipe get out the band, in your position, Rafael Cordeiro has entered. Some months later, Cleuson left the band and in your place has entered André Gomes, by André indication, Adriano Blakk assume the Vocals. Blakk shows that he has the perfect vocal for the Without Fear Style. In this period was wrote the songs "Burn In Hell" and "Death Warrant". But this formation don't stay together a long time. André left the band because a tendinite. Cleuson come back to the band, but with not so time to assay. It was a despair decision, because they have a little time to the first presentation of the band, that was in the First Idiomas school. In the set list there was own songs like "Burn In Hell" and "Death Warrant", and so many band covers like Megadeth, Kiss, Mötörhead and Black Sabbath. After this presentation, Cleuson definitely left the band. For his place they called Fabio Farol. For they presentation in the school First, the band played too in the First Awards 2003. 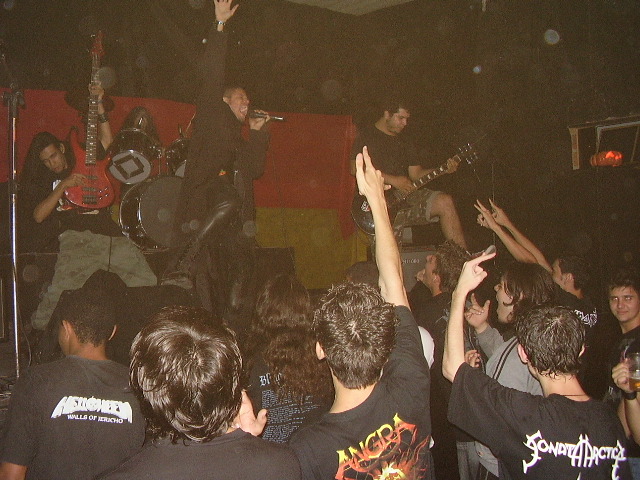 The festival was a championship with all the bands that played in the school during all the year of 2003. Without Fear won 2 prizes, The Best Performance In Stage and The Best Band. After this presentation, the drummer Rafael left the band, because a lot of discussions with another band members. For the Rafael Place there was called Aislan. Some assays later, Fabio left the band, in your place entered Renato Bonani, a friend of a long time de Luiz. When Fabio left the band, Luiz began to re encounter with Renato, what results in a new guitar player to the band. Later, Aislan left the band too. After many talks to solve the past problems, Rafael come back to Without Fear. With this formation the band worked in own songs, like "Ghosts of Past", and too in new band covers, like Iron Maiden. Days later Luiz left the band. Some time later entered in the Bass position the bass player Felipe Ojidos, that was a friend of all the band a long time and watch all the assays. A Time later, rafael definitively left the band. In his position was called André Batista, André was entered in a agitated moment of the band, cause they have 3 shows to do, and there was not so many time to assay. But his intermeshing with the rest of the band was prefect. Whathever, André introduce a new sound concept in the band, the use of Double Pedal. in September of 2005 Renato Bonani left the band. For this place, entered Fernando Ciríaco, school friend of Felipe. His influences augment more sound to the band, because he like variety styles of music. With this formation the band did various presentation in the extinct "Bar Sociedade Alternativa" (Alternative Society Pub), and worked in many others own songs, like "Sowing The Chaos", "Gates of Sorrow", "The Clan Without Fear", "...And The Journey Begins" and "Out of The Earth". At the beginning of 2007 Fernando left Without Fear because he was not going to assays and distance problems. Get a lot of time until a ideal guitar player was founded, and, the band has a history of greatest guitar players, that made the job to found a new one a little frustrating. And this ocurred just in a ascension moment to the band, when the shows on Underground Bar started to positive spread the image of Without Fear. In this age, ocurred too the recorded of a caretaker Demo, with 4 tracks: "Out of The Earth", "...And The Journey Begins", "Death Warrant" and "Burn In Hell". After some time, Guilherme showed himself to the band, and showed that he was very interested in make part of the Without Fear. In the first assay, the consensus was overall, Guilherme was the newest guitar player of the band. The musical knowledge of Guilherme up the band level, by the way, turn a great friend of all. Well, this was always definitely in the band, the eternal friendship. With Guilherme in the group, the band started to compose new songs like "Where Have Those Days Gone? ", and make variety covers like Helloween, Mr. Big and Angra. Today the band get through with many spreading and shows in the São Paulo Estate's interior region. The actual set list have own songs and covers of Iron Maiden, Metallica, Helloween, Van Halen, Judas Priest, etc.